We Have Always Lived in the Castle begins in a once-beautiful manor that has fallen into disrepair. Chronologically, this is the last scene in the film. Mary Katherine ”Merricat” Blackwood (Taissa Farmiga)’s narration introduces us to her family, the Blackwoods. She begins to write down her story, and the film jumps to the events of the previous week, with an intertitle that reads “Last Tuesday,” appearing on screen, a time when things in the Blackwood’s home were markedly different. “Last Tuesday” must eventually lead to “This Tuesday;” these days must eventually lead to the present, to the state of dilapidation we saw at the start of the film. It’s an effective start to a film mostly focused on this very question: how and why do things, people, and families - fall apart? In Stacie Passon’s We Have Always Lived in the Castle, an adaptation of Shirley Jackson’s 1962 novel of the same name, Merricat and her older sister Constance Blackwood (Alexandra Daddario), live in a large manor, and care for their unstable, wheelchair bound Uncle Julian (Crispin Glover). They are the only remaining members of the once-powerful and wealthy Blackwood family, ostracized and feared by the nearby town ever since their family was poisoned five years previously, presumably by Constance herself, who has been acquitted of the crime. When the girls’ cousin Charles Blackwood (Sebastian Stan) arrives with a mission of his own, tense family dynamics are thrown into further disarray. Merricat Blackwood is a peculiar, superstitious young woman with an interest in spells, curses, potions, and poisons. She has a black cat named Jonas. She has memorized a vinyl recording of Richard III. Most importantly, she is an unreliable narrator, a trait, we discover, runs in the family. Farmiga gives a performance as Merricat that feels fully realized, from her awkward posture to her alert, nervous eyes, she adheres to the quirky, otherworldly feel of the film while grounding the character in some realism. Constance Blackwood appears wholly put-together, a perfect picture of a mid-century housewife. She is bound to the house and its grounds by agoraphobia, as well as her overwhelming responsibilities to the house and her family. Constance is fabulously acted by Daddario, whose face is plastered with a painfully bright smile as she constantly cooks, cleans, gardens, appeases, and diffuses. She, seemingly used to her painstakingly thorough routine, has no idea how to react when Charles (the weakest character by virtue of being the most transparently motivated of the main cast) re-enters the family’s life. 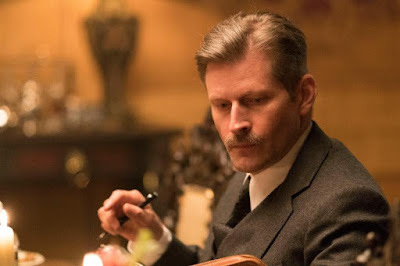 Crispin Glover as Uncle Julian is eery, his dialogue poetic; he has long, wandering monologues that only add to his unsettling effect. Thematically the story is brought together well by Uncle Julian - we discover that despite his constant poring over details of the night of his family’s demise, gaps in his memory have led him to be an unreliable storyteller as well. “This is a mad house,” Charles says, and at some points in the story this seems true, that the house itself has cursed the Blackwoods and caused their bad luck. But the family’s curse has wordly, more simple causes: the questionable behavior of human beings. It is cycles of instability, abuse, and emotional manipulation that lead to tragedy and suffering for the Blackwoods, and ultimately destroy the family from the inside. A somewhat narratively aimless but thematically and aesthetically cohesive film, We Have Always Lived in the Castle is a tragic rumination on what destroys families, and what saves them. The Blackwood Manor is central to the family’s identity, and the setting in which most of the film’s scenes take place. As such, the manor understandably feels like its own world, beautifully crafted, toeing a line between realistically lived-in and as whimsically decorated as a book’s illustration. There are two distinct states the manor is shown to us - before and after its destruction, and the juxtaposition of these images is beautifully accomplished. The gorgeously furnished hallway, kitchen, and dining room of just a week prior are juxtaposed with the decaying, hollow manor seen in the first and final scenes. There is a dark but kitschy whimsy in the aesthetic choices, particularly the color palette and musical cues. The yellowed greens and red accents add a unique and interesting visual character without feeling unfit for the story, and also add a sense of cohesion throughout. The score, more heavily used in the first act, is comparatively more heavy-handed, but as the film begins to quiet toward the second half, the select period-appropriate musical cues feel more fitting. The shot variety is delightful in this film; there are some gorgeous overhead inserts and extreme close-ups that enhance kitschy props and delightful set design, and beautiful editing creates effective momentum in several emotionally heightened scenes. The sound design is detailed, scintillating, as well. Taps of glass and dishware bring attention to the details of the set dressing and props. It’s these details that make the filmmaking choices feel thorough, above all, and contribute to the sense of a fully crafted storybook world. The elements that mark this film most clearly as an adaptation of a novel are impressively well-incorporated, and make everything feel like a personal entry in Merricat’s diary, linking every scene to the image we saw at the start of Merricat sitting down to write the events of the previous week. The voiceover, illustrations, and intertitles marking the time enhance the themes of unreliable narration and emphasize the nature of storytelling, rather than feeling like adaptational shortcuts. 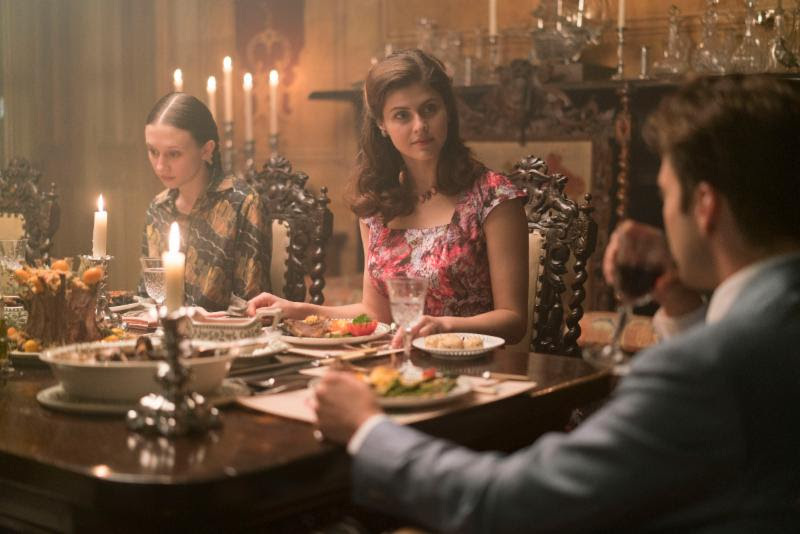 The dinner wherein the Blackwood family is poisoned is referenced like a myth or folktale by the Blackwoods and others, mistold, misremembered, and twisted to create a sense of frustration and doubt in the viewer. This doubt, that comes from both the failings of memory and deliberate lies, are at the heart of this story, and what makes the mystery of the film confounding and enthralling. It is these lapses in objective storytelling that create the mystery of the film, not the usual thrill of apprehending a killer or seeking justice. This film is not a classic whodunit or a whimsical story of magic and witchcraft, but rather a slow, almost comically confounding folktale, where the underlying, creeping suspense throughout comes from the tension of the interpersonal interactions. This may frustrate viewers expecting a shocking revelation or twist they won’t be expecting; this film is largely lacking in twists and turns. This film is more interested in exploring the dynamics of a family who has fallen from grace, as well as the stories and lies they tell themselves and others. “I wonder in about a month from now, who will still be here,” Charles says to Merricat, “You or me?” It is this tension that drives interest in the film as it proceeds, the way these destructive, isolated people have destroyed their own family, and the potential they have to do so again. We Have Always Lived in the Castle has a rough start, its focus initially unclear and its narrative aimless. By the second act, the film begins to more singularly explore,in a way that feels both delightfully literary the remains of a once-powerful American family. A young woman’s retelling of the tragic fall of her family is made more enthralling by strong performances, a unique visual character, and a world that through small but important choices in cinematography and sound design, feels fully realized.